Introducing our new interactive story books! Here is where you can check in on our growing collection of amazing stories. Fun stories with interactive elements, mini games, and activities all included. You can even customize each story with your own photos! 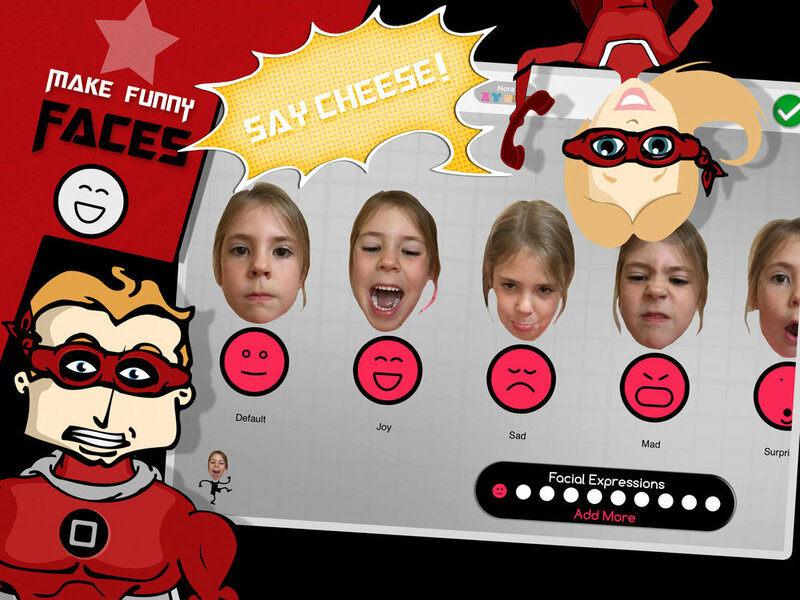 Our custom character creator allows you to take many different photos for all your emotions. We then automatically animate these emotions inside of the story for amazing funny interactions! first book is Available Now! 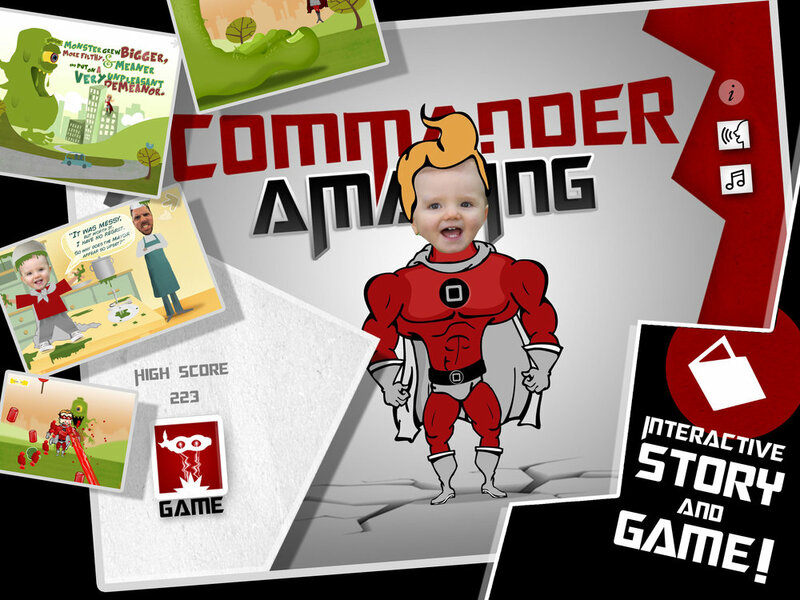 We are excited to introduce our first book "Commander Amazing"
You can become the HERO and save the day in this fun filled interactive story. Customize with your own photos. We use up to 10 emotional photo faces to animate your every mood in the story. Hilarious fun for kids and adults. There are two customizable characters in this story, so an adult can become the mayor character while the child becomes the HERO! Or you can switch it however you like. Includes a fantastic mini game as well! Download and get started! Written and Illustrated by Lance Harris. Programming by Heber Sheffield. Narrated by Jesse Lowther. Music Credits: "Achilles", "All This", "Danse Macabre - Low Strings Finale", "Failing Defense", "Happy Boy Theme", "Hero Theme", "Mistake the Getaway", "Take a Chance"
Become a CENTAUR HERO on a magical quest! Engaging story, wonderful animations, and fully interactive characters! Choose your own way through the adventure. Encounter Trolls, Mermaids and Dragons. Heed the sage advice of the Mage. Use your magical artifacts wisely. Customize with your own photos. There are three customizable characters in this story, so an adult can become the MAGE character while up to two children can become a baby CENTAUR or even the HERO! You can switch it however you like. Includes a mini activities and games along the way! Written and Illustrated by Lance Harris. Programming by Heber Sheffield. Narrated by Katy Henderson. Music Credits: "Achaidh Cheide", "The Forest and the Trees", "Skye Cuillin", "Celtic Impulse", "Moorland", "Thatched Villagers", "Errigal"
Become a magical flying protector of your own garden habitat! In this story you will find and raise a butterfly through all the stages of metamorphosis. Trim the hedges in your garden, water plants, and fight off invaders! Customize with your own photos. A child can become the HERO and an adult can become the Lady Bug General. This engaging story with included mini activities will delight young and old. Written and Illustrated by Lance Harris. Programming by Heber Sheffield. Narrated by Rani Bean. Music Credits: "Divertimento K131", "Divertissement - Pizzicato (from the ballet Sylvia)", "Ranz des Vaches", "Scheming Weasel (faster version)", "Scheming Weasel (slower version)", "The Path of the Goblin King"
Customize your own Monster Costume. Play in the Monster Games! Learn about true friendship and acceptance in this fun filled tale. Customize with your own photos as you become the star of the show. Written and illustrated by Lance Harris. Programming by Heber Sheffield. Narrated by Nora Beth (age 6). Music Credits: "Beachfront Celebration", "Bumbly March", "Easy Lemon", "Hidden Agenda", "Kick Shock", "Monkeys Spinning Monkeys"
Help Pastry pirate fight his arch nemesis... Captain Flapjack! In this fun adventure you get to wage battle on the high seas using pastries and pancakes! Decorate you own delicious creations, customize your story and have fun. Illustrated by Rani Bean. Written by Lance Harris. Programming by Keli Fancher. Narrated by Adam Woolley. Music Credits: "Clenched Teeth", "Crossing the Chasm", "Galway", "Meanwhile in Bavaria", "Mischief Maker", "Rainbows"
Q: My face profiles don't seem to be saving or are crashing. A: We use Apple's secure iCloud services to save your photo head library for your head profiles. This means that you will have access to these head profiles across your devices that share the same apple id. However, if you are having trouble with your iCloud account, please resolve those issues with Apple and your head profiles should then save properly. Q: I can't take images of my own face. A: Make sure that you have allowed permissions for photo access for the Commander Amazing app. To do this, go to you device's home screen. Now find the settings app (grey gears icon). In the settings app scroll all the way down the list until you find "Commander Amazing". Tap. Make sure to turn on permission for photo access. Q: Does giving this app photo access let the developers see my photos? A: No. It simply allows you to take photos from inside the app. It also allows you to choose from your own library of images. Q: I accidentally disallowed camera or photo access, now I can't make custom characters.